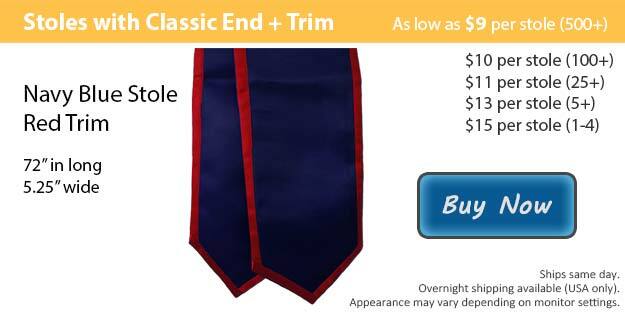 We have a navy blue graduation stole with red trim that is a prime choice. There couldn't be a better way to allow your group or club to stand out at your ceremony than with our graduation stoles. All your hard work is finally about to pay off, graduation is coming up fast and Honors Graduation can help you prepare for your big day. Here at Honors Graduation we have all graduation attire you need to look your best. Your family and close friends will come from all around to be there for you, cheering you on and showing just how proud they are of you. It is important to look good for your graduation ceremony, it is a day that you will cherish for years and years. Students can usually be found wearing the traditional graduation attire which is a graduation cap and gown during graduation. At Honors Graduation we have convenient package deals that give you the all basics you will need, such as your cap, gown, and tassel for example. We also have a good amount of graduation accessories that do a wonderful job of bringing your graduation outfit together beautifully. At Honors Graduation we have a lot of different options when it comes to our graduation stoles. There are two different options for the finish on your graduation stole. We offer an angled cut or we also have the classic finish as well. We have over fifteen great colors to mix and match for the exact combination you want for your stole and the trim. Stoles are even available without the trim in case you would like a solid stole. Using embroidery, our customization team is able to personalize your graduation stole by adding whatever image or wording you wish.